I hope everyone had a fantastic New Year and got extremely drunk - I did! So it's approaching that time of year when I have my annual haircut. I hate going to the hairdresser and that's why my hair is so long. However, I know when it's getting too long and i'm afraid to say, it's time for the chop. I'm not really sure what I want done, I just know I need something! 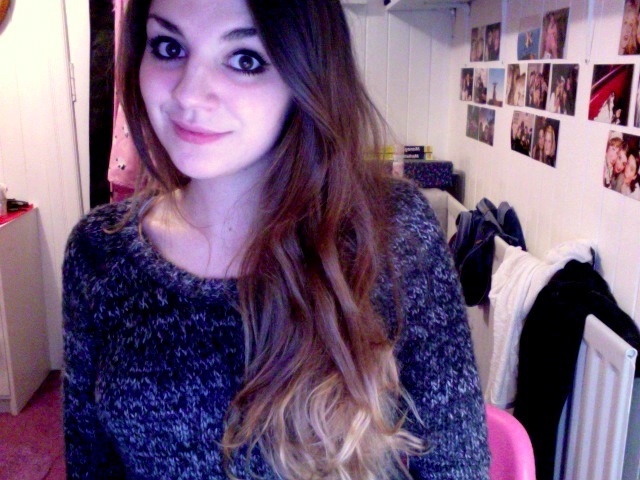 For the majority of 2011, I followed the ombre hair trend, almost a requirement for bloggers these days. I wanted to do something different with my hair and I really do love the lighter ends but they are getting really dry and no amount of conditioner is going to help me now! Even though I will be getting rid of my lighter ends soon, I've put below a 'Guide To Ombre Hair', a few steps that hopefully you can follow and create the look for yourself. I know it would probably be easier to show you guys pictures, but as I said before, I bleached my hair months ago and didn't have my wee blog then :P haha hope the written steps are ok! I will probably be booking a hair appointment in the next few days... WISH ME LUCK! Here are a few photos taken of my hair back in October. 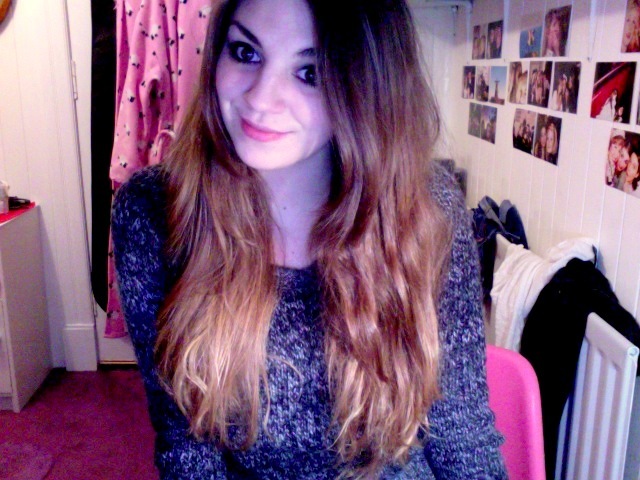 Took them on my webcam but I think it shows the ombre quite nicely. Note - You need a hair BLEACHING KIT, not HAIR DYE. People can buy the wrong kind and wonder why they haven’t got ombre hair! 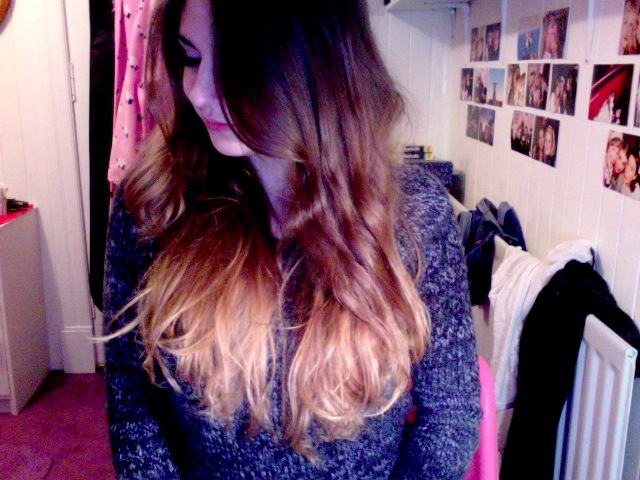 Achieving ombre hair is very easy and should only take about 20 minutes, don't worry if you take longer though. I also suggest wearing old clothes or use an old towel round your shoulders. Bleach can dye your clothing so be careful! Now you are ready to ombre! Step 1. Separate hair into two sections, one on either side. Step 2. Tie back one side so you can focus on the other. Step 3. Brush out hair, making sure there are no knots. Step 4. Remember to wear the gloves provided. Follow the instructions on the back of the bleach container and mix your solution. Step 6. Use an old hairbrush to spread the bleach evenly through your hair. IMPORTANT - be careful! This is hair bleach and mistakes can be made. Just take your time and apply it slowly. Step 7. Now do the same for the other side of hair. Try and get the level right so that it is even all over. Nothing worse than one side more bleached than the other. Step 8. Once both sides are done, leave the solution to work its magic and after the allocated time, wash it out of your hair. Step 9. Dry your hair and check the results. You may need to do it again depending on your hair colour and thickness. BE AWARE - bleaching your hair can make it very very dry. If you need to apply again, be careful not to leave it too long as this could seriously damage your hair. Step 10. ENJOY YOUR OMBRE LOCKS. Love this post! Did you just bleach the very ends? Because your hair looks to gradually go lighter towards the ends anyway, is this natrual or is this bleach too? I may try this! It was really bright when I first did it but after several washes the colour dulls and fades into more natural tones. I really like the ombré look - it looks great on you!! Thanks for the step by step instructions. Your hair from October looks great. I need to get my hair cut too, but I don't really like getting my hair cut that often either. But I think your hair is beautiful the way it is, so maybe just get it trimmed? omg! looks amazing! ive been thinking about doing it, but my hair is getting dry as is lol not sure if i should do anything to it. Hope you had a great new years! You hair is so pretty! Haha, I got very drunk on New Years too. Your hair is so long and lucious, don't cut it too short! I think 2012 is def the year for a bit of style added to my hair do...we shall see. Happy Wednesday. You look great with the ombre hair! I actually haven't gotten a professional haircut in about 3 years, I just trim it myself when I get bored haha! Thanks for the tutorial! 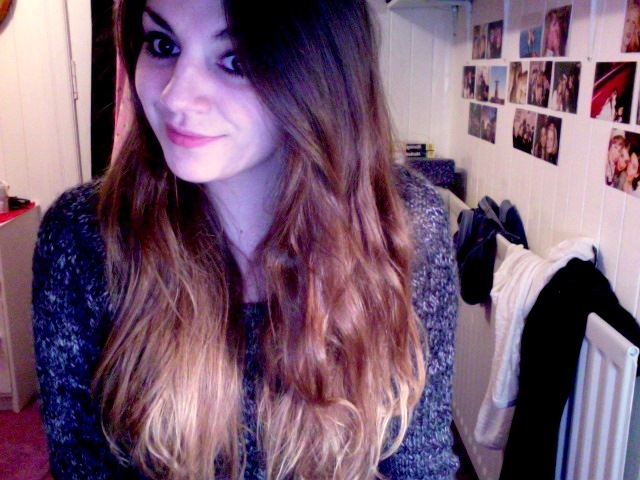 Lovin' the ombre!! I'll definitely be following the blog! I just made a blog a few days ago and would really appreciate it if you could follow me back!